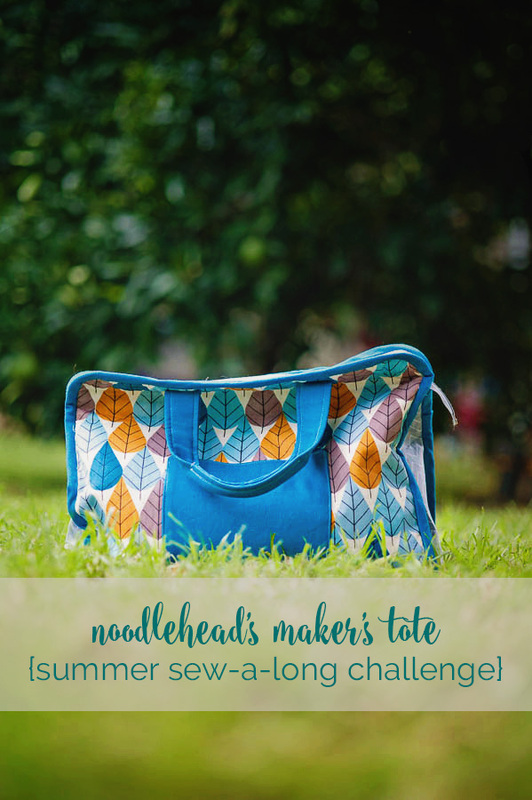 Around the middle of term four last year, AJ shared with us the very cute Maker’s Tote pattern by Noodlehead. As soon as I saw it, I knew it would be perfect to stash all my bits and pieces in for out roadtrips, and next minute, out comes the C word. Yup. The challenge was thrown down, and so begin the search for fabrics. I had narrowed it down to a Viewmaster film print and the feathers I ended up going with…and I wish I had gone the other way. I love the pattern, I love the bag design, but I am not loving the outer fabric. Said fabric sat on my desk for a couple of weeks after it arrived, as I knew Santa was being quite kind to me and there was a lovely new Janome Horizon destined to be under the tree, and what better to break it in with than a new bag? So then, of course, after Christmas, we went camping and my mother-in-law came to stay and school uniforms needed to be sewed and and and… in the end, AJ absolutely trounced me in the sewalong stakes, but I managed to sneak some time to get it finished after the three (!!) big children went back to school. It’s now home to my stitching, so I can tuck it neatly at the end of the lounge, with all my projects together. Of course, me being me, there were a couple of changes – both unintentional! The front patch pocket is slightly smaller because I mixed up the cutting instructions for the large vs small bag. And then inside pleated pockets have a slightly smaller pleat depth as my linen fabric was one teeny tiny inch too narrow. Of course. I also didn’t add a snap to the outer pocket as I didn’t need it. I really loved making this bag, it was a reasonably easy pattern, and came together quite quickly. I’m thinking I might make another one, in the smaller size, as my swimming/drama/music/emergency-craft-stash-for-kids-activities bag. Doesn’t everyone take a project or three with them every time they leave the house? It looks great Rach. It’s on my to make list too. Thanks! Its a great little bag, I’m loving it.